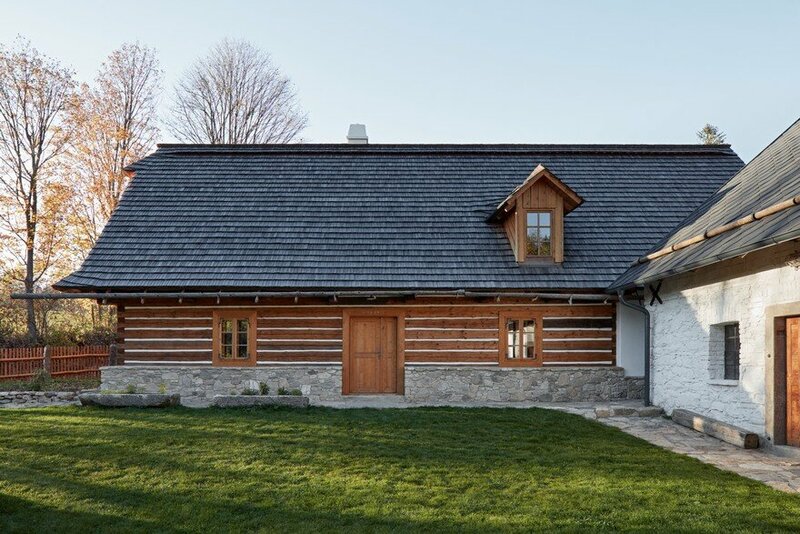 In this countryside homestead reconstruction project we were searching answers by means of respect to the original building logic and traditional construction techniques. 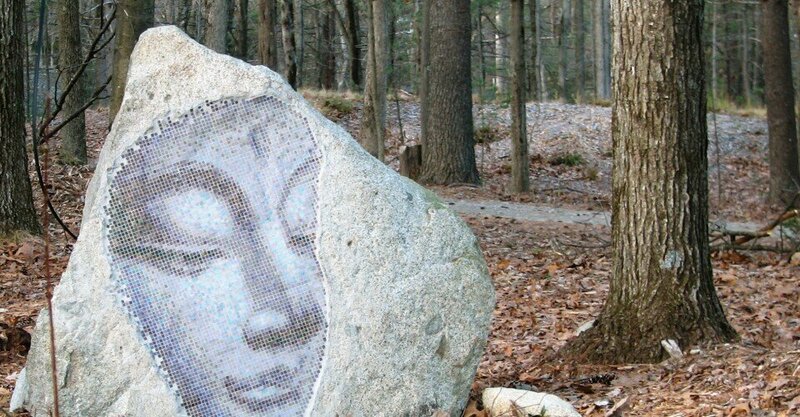 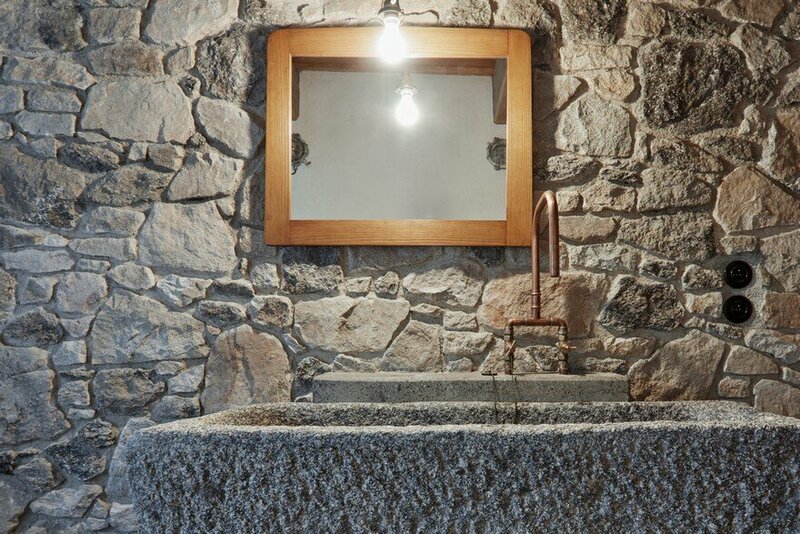 Our aim was to attain a natural feel instead of a perfect formal imitation. 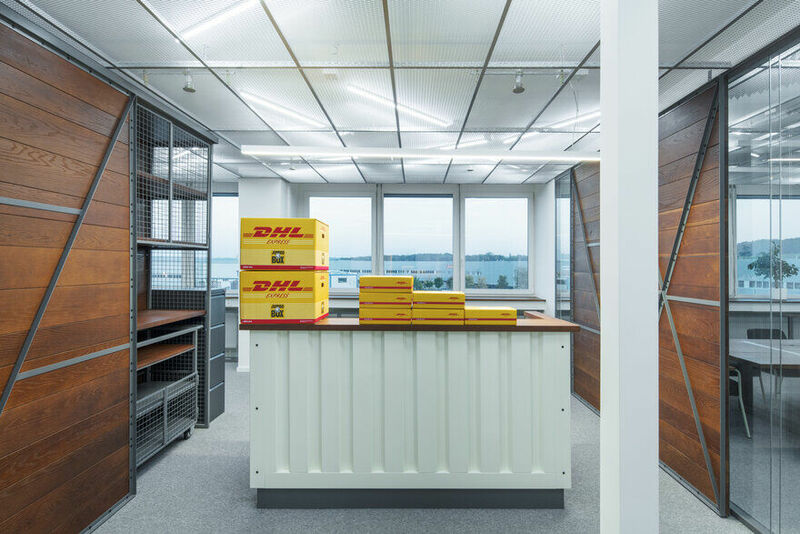 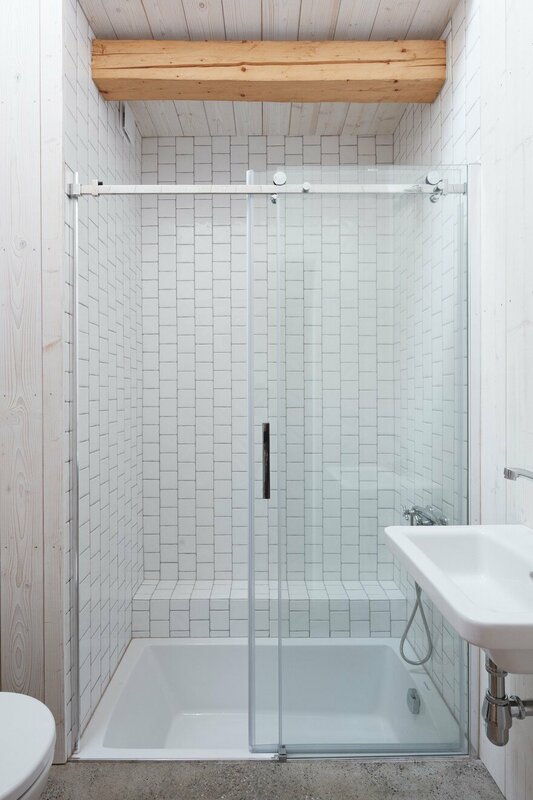 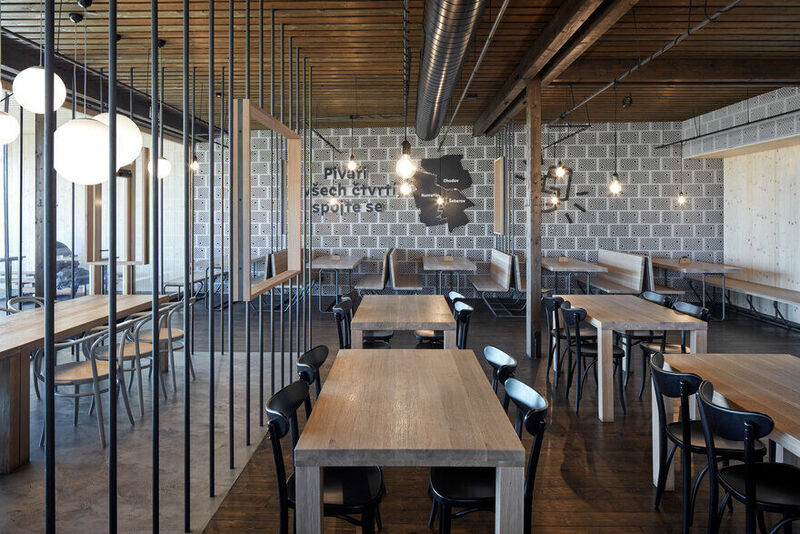 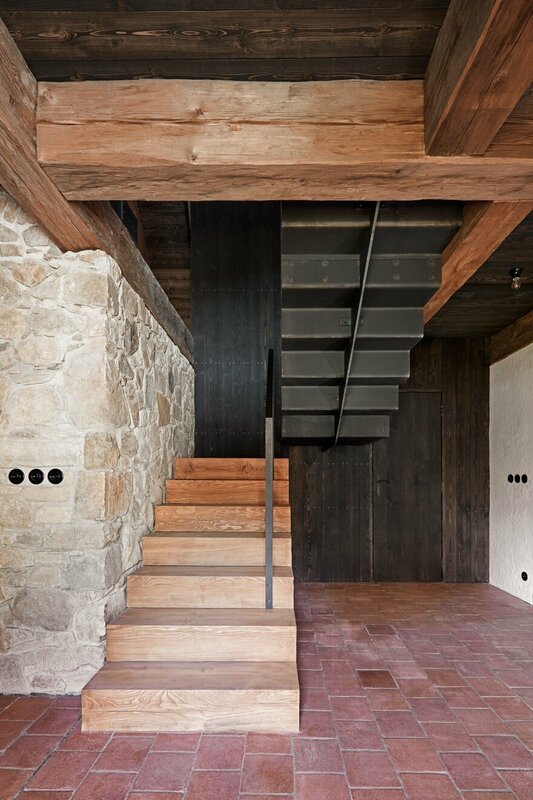 Natural and handcrafted materials like wood, stone and soil bring in an innate imperfection that becomes the main aspect of the project, considered since the beginning of the design process. 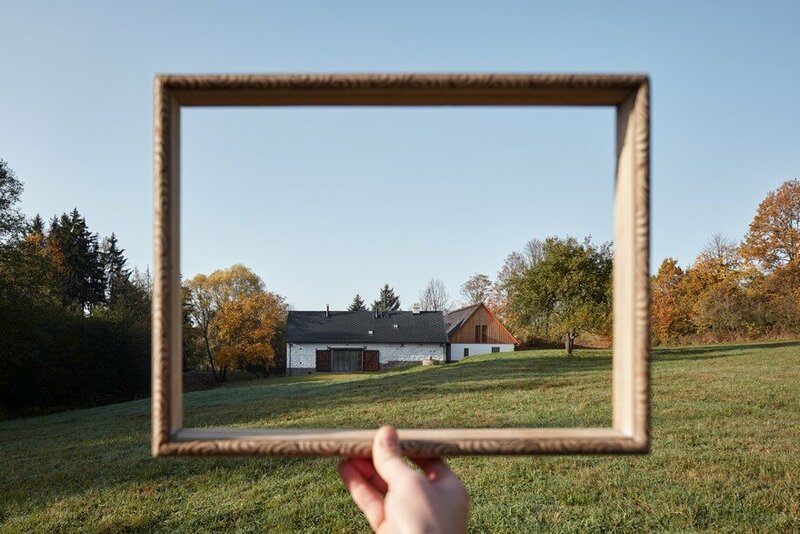 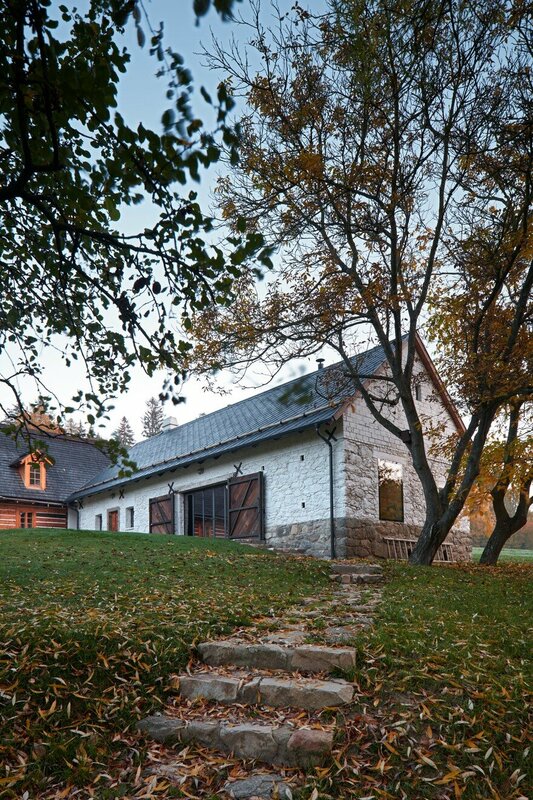 The original countryside homestead consisted of two houses, a log cottage and a stone barn, forming an L-shape an set naturally in a remote meadow. 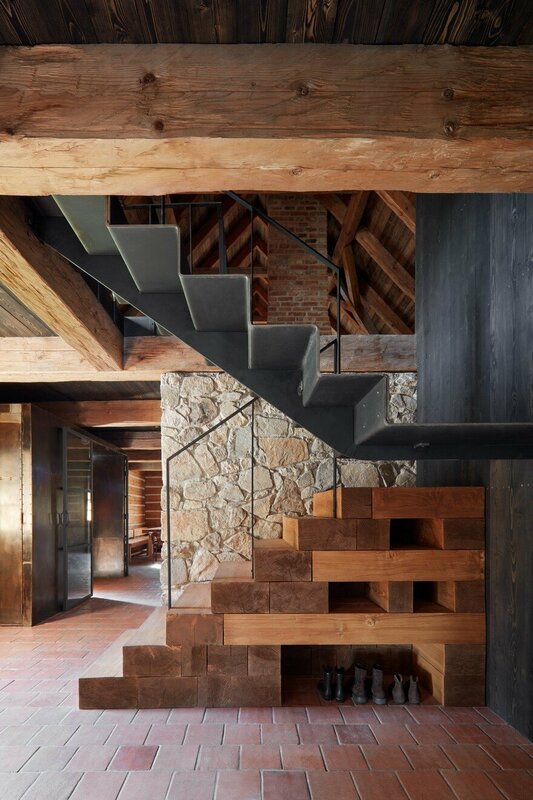 To keep this balanced relation we decided to make minimum interventions on the exteriors, the main changes happen inside. 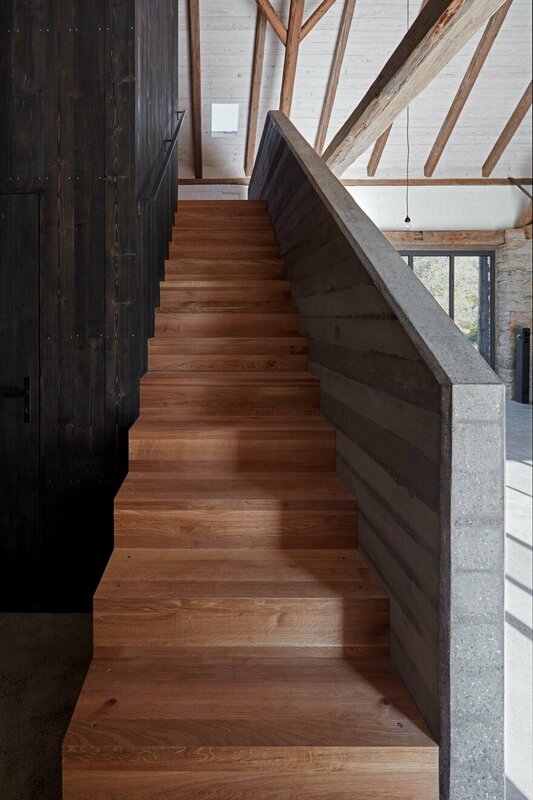 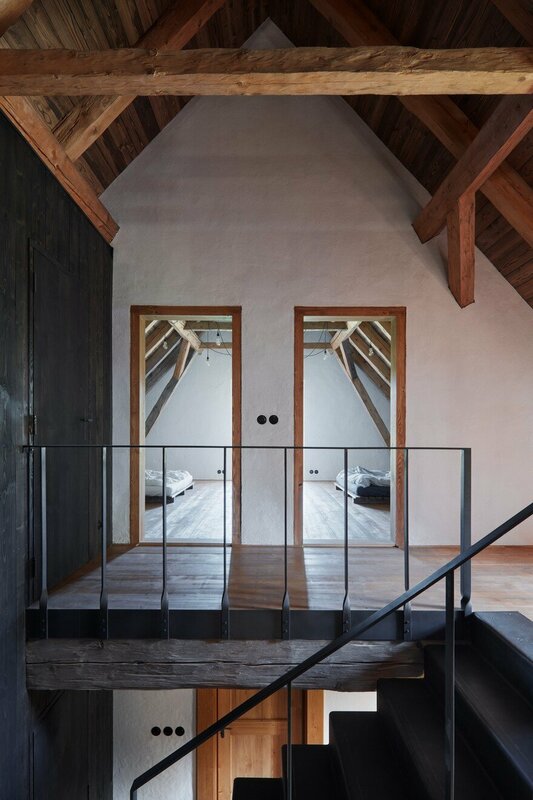 Both houses have a living space open up to the roof to emphasize an original specific feature of each of them – the sculptural volume of the traditional black kitchen in the cottage and view through the gates in the barn. 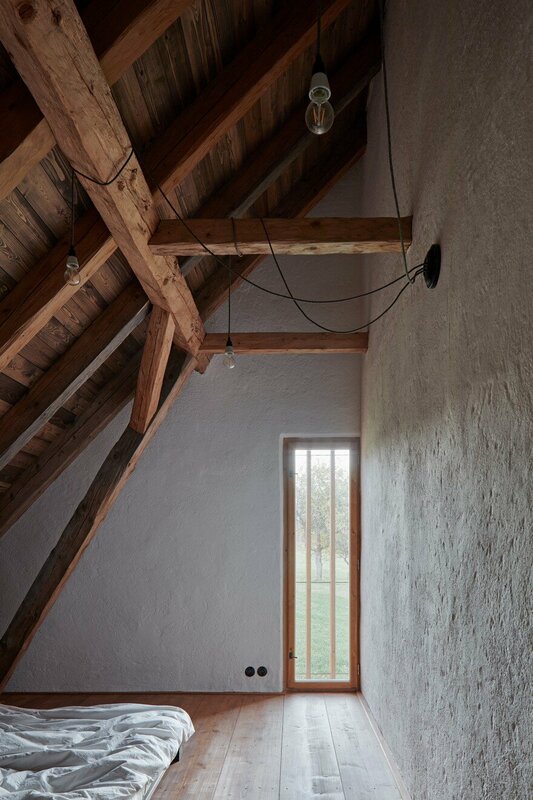 There is also a new addition in both houses resembling a black “chimney” that houses sanitary cores, standing as a dominant in the barn while discreet in the cottage. 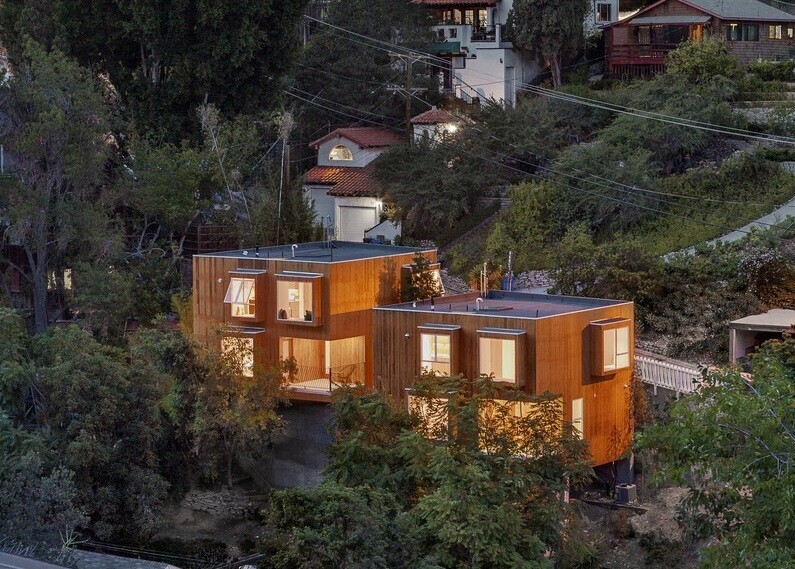 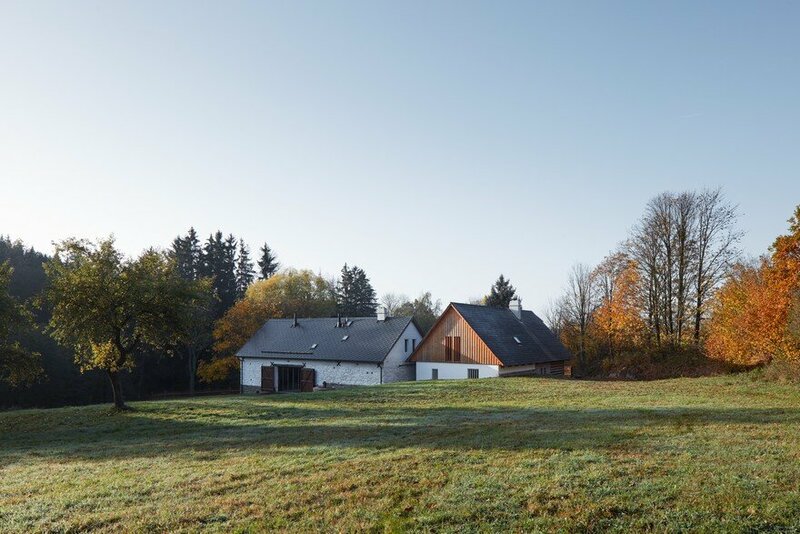 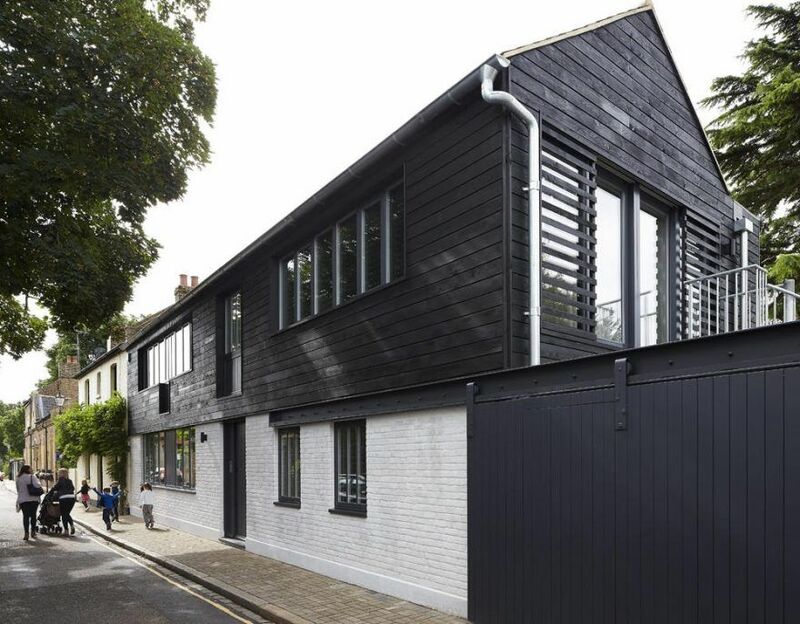 The duality of the two houses links the whole project – their different character and original function are reflected in the new use and overall approach to the reconstruction. 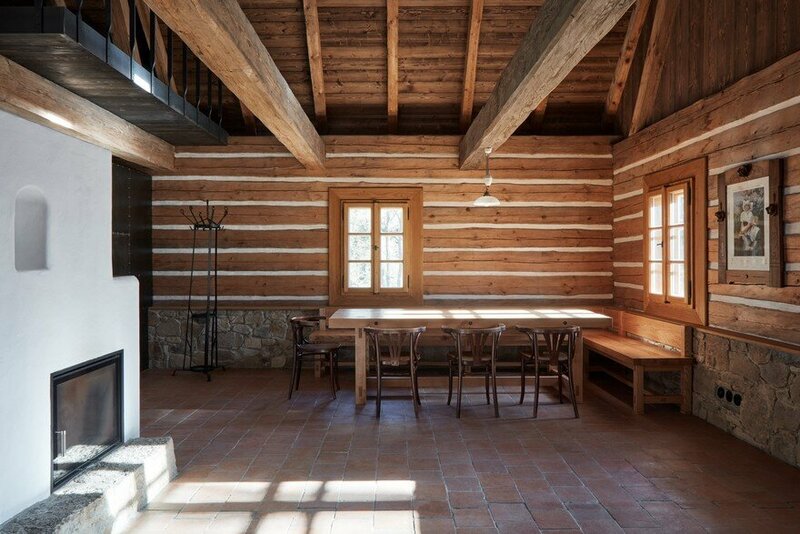 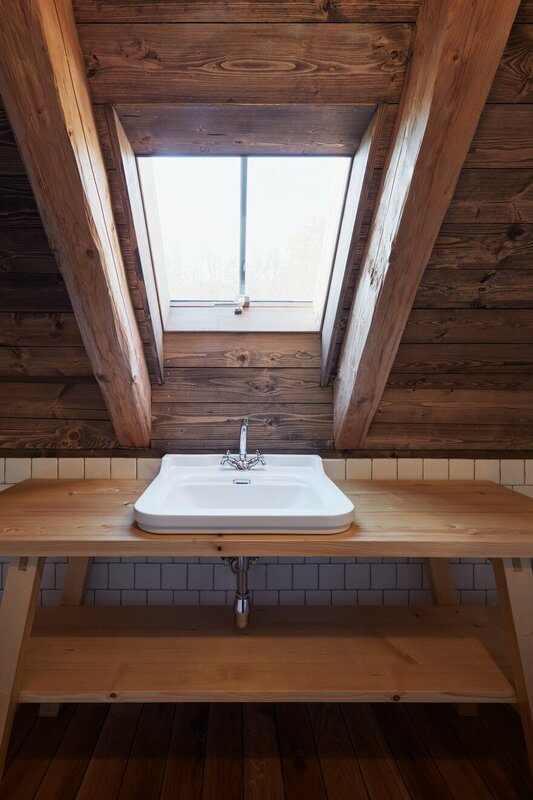 The log cottage is designed for the stay of the owners family and is conceived more traditionally, although most of it was in such a bad technical condition that it had to be replaced. 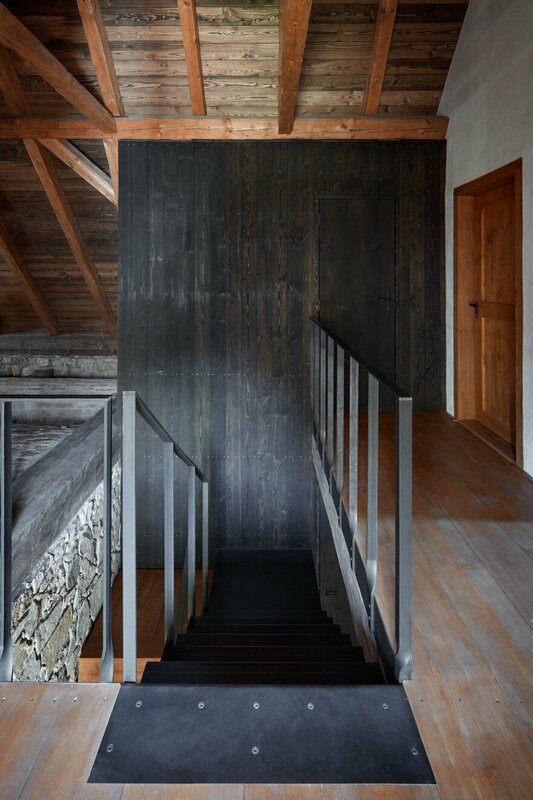 Like the typical vernacular houses it stays rather dark, closed and intimate, its character is mainly brought by rough handcrafted surfaces. 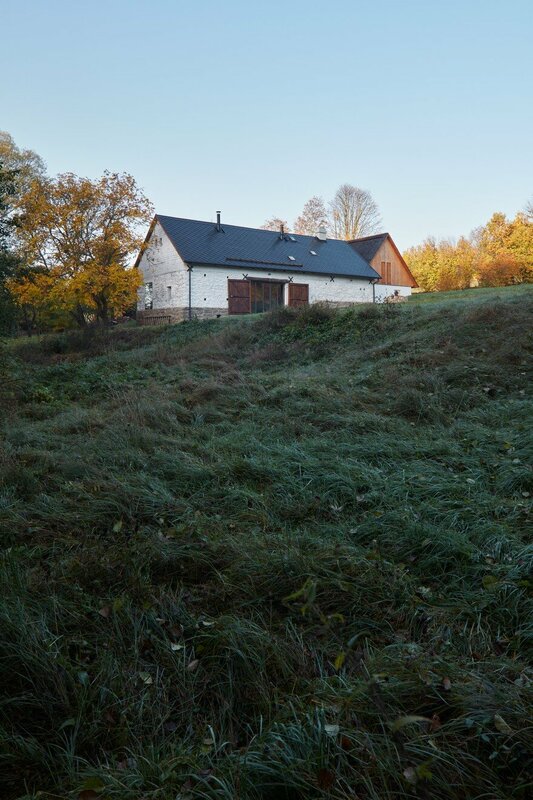 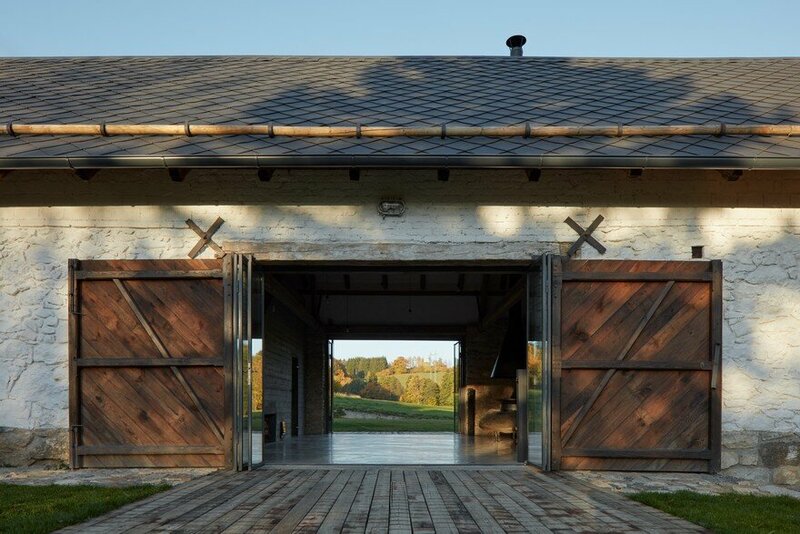 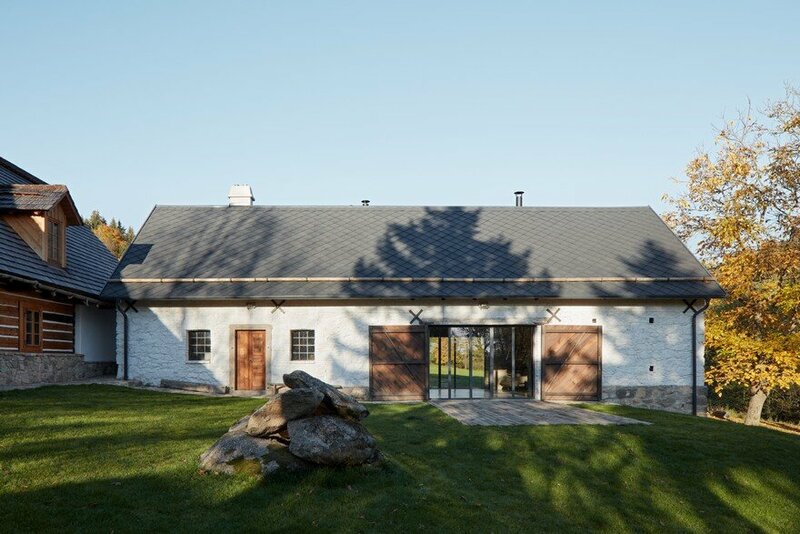 The barn has been a supplementary house, it serves as a summer living room and spaces for guests. 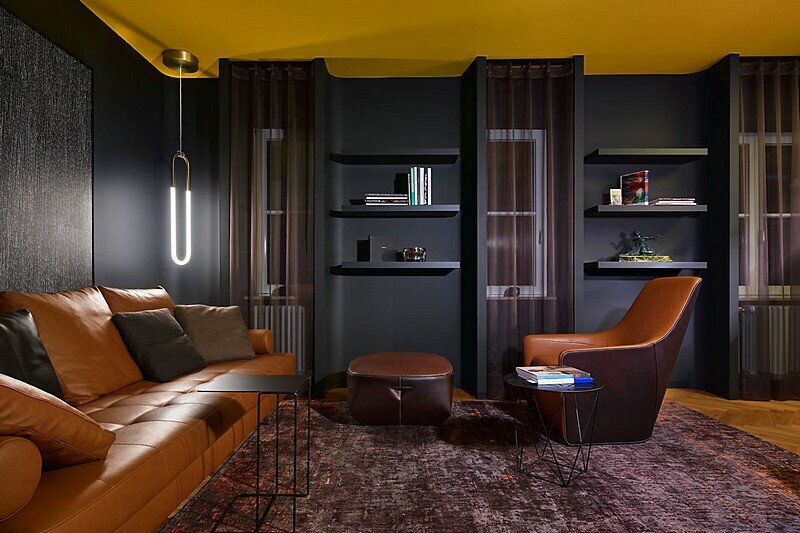 The overall feel is more open and light, the interventions are more daring. 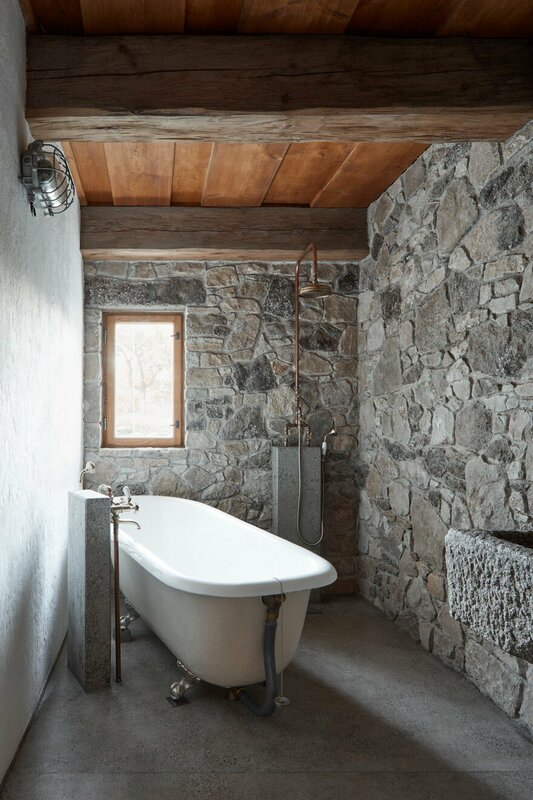 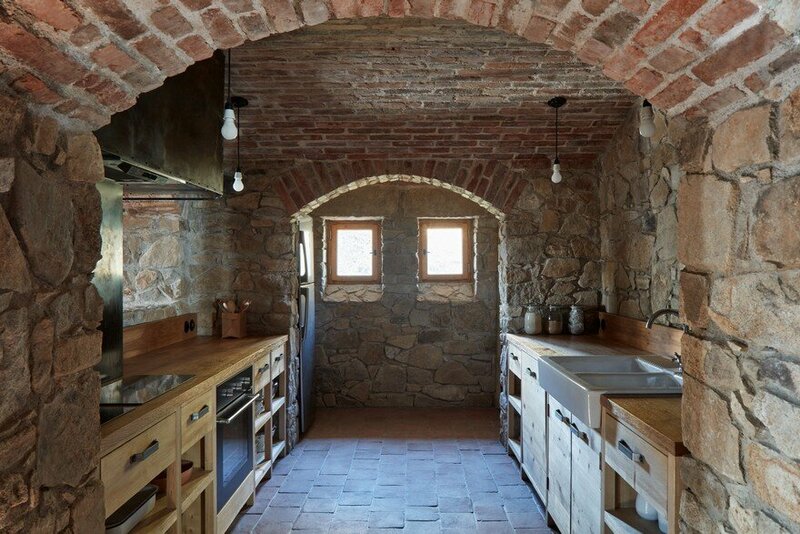 The original stone walls are completed with a new concrete wall that hides a staircase and a sauna. 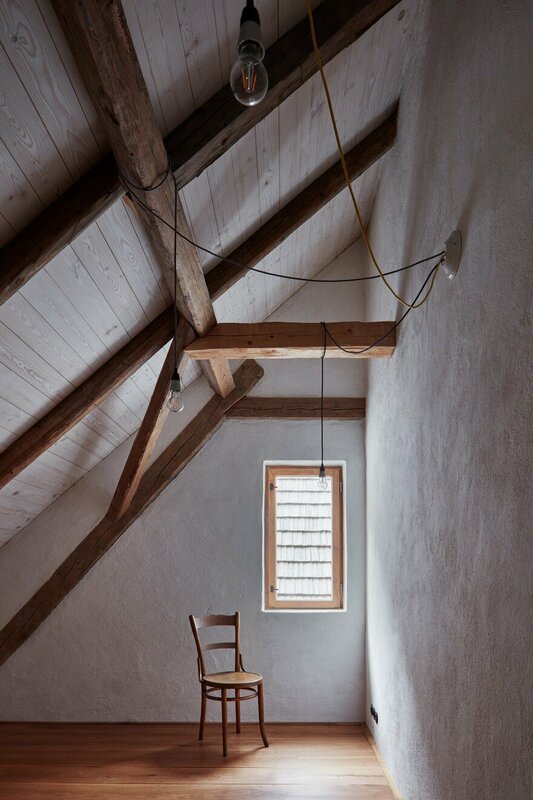 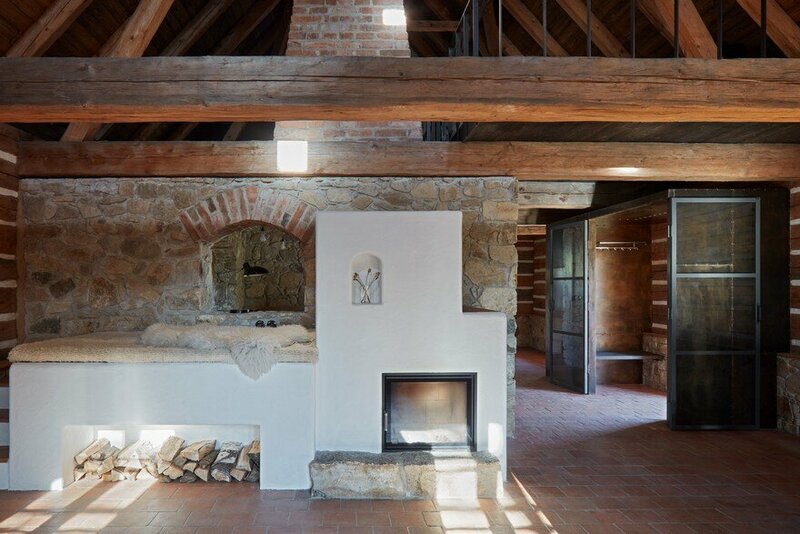 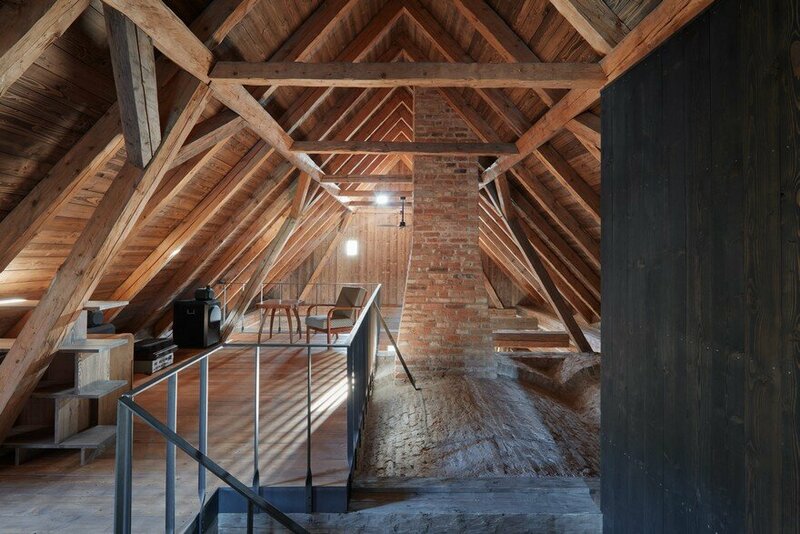 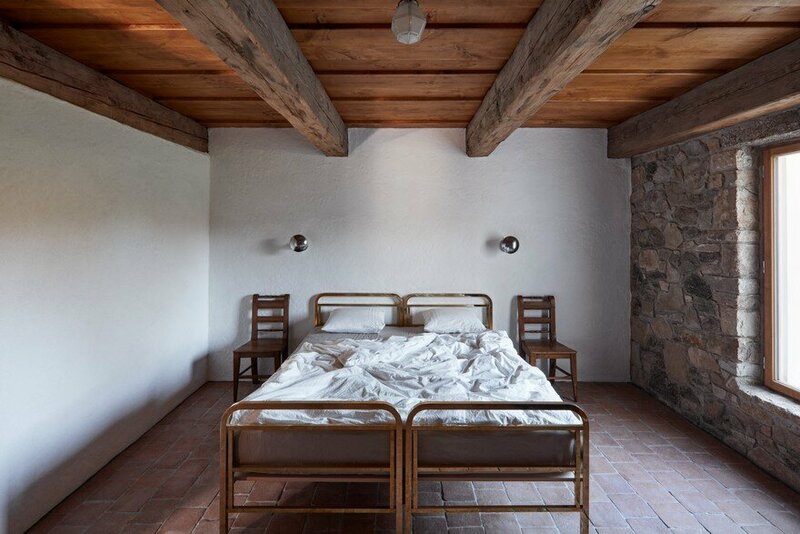 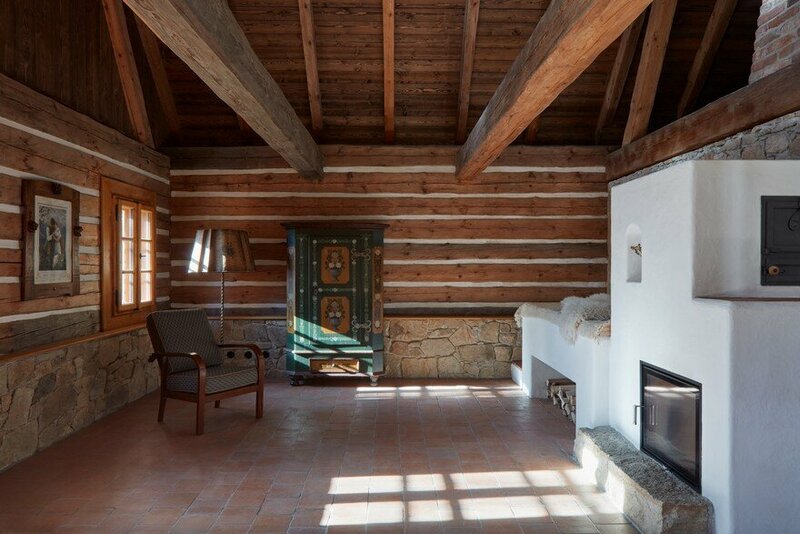 Above these walls all inner surfaces are united with white paint in order to emphasize the original wooden roof frame. 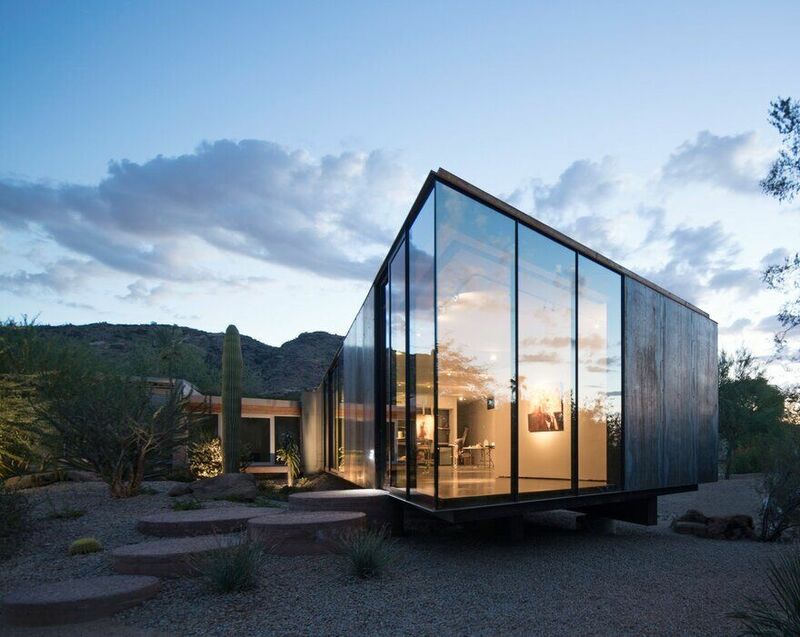 The main living space extends to the terraces by folding glass doors and also opens up towards old trees by a large fixed glass. 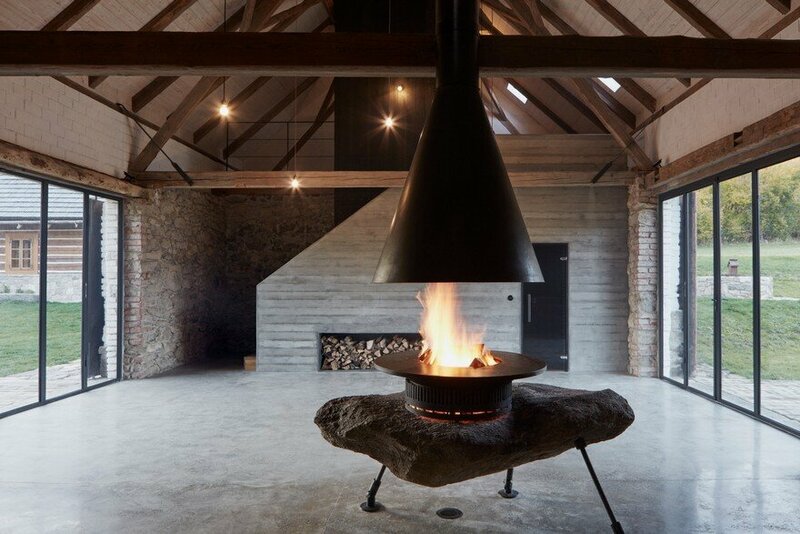 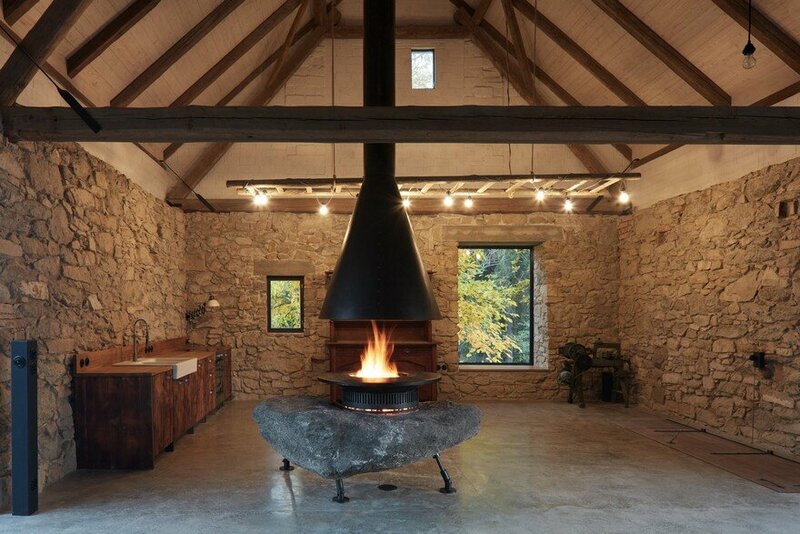 The new heart of the space is the open fireplace created of a massive stone from a nearby slope.